So, you can imagine her surprise when our little man came along and none of the new “toys” were for her. 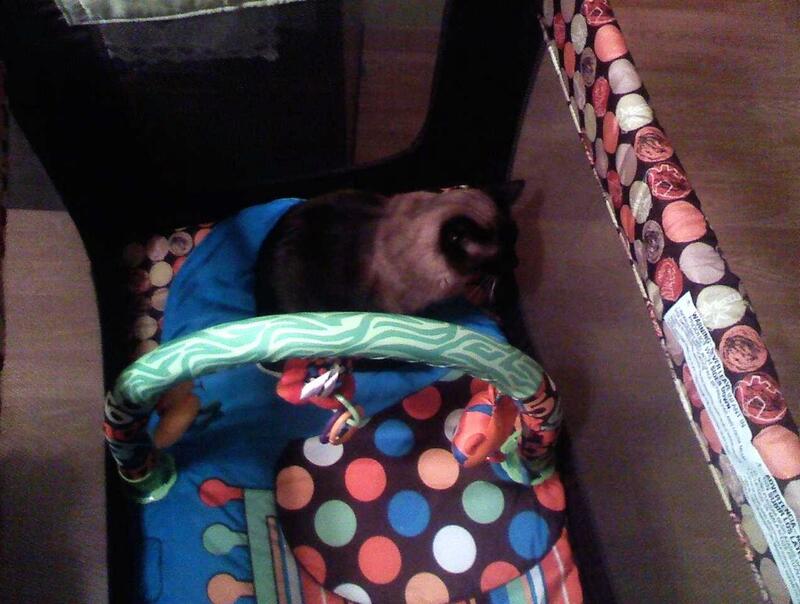 I wish I had my camera out to capture the expression on her little furry face the first time she heard the baby cry. I’ve never seen anything like it! I never even knew it was possible for a cat to make such an expression. One of complete shock, confusion, and fear all at the same time. She spent the first four days after we brought “G” home curled up on her kitty condo. 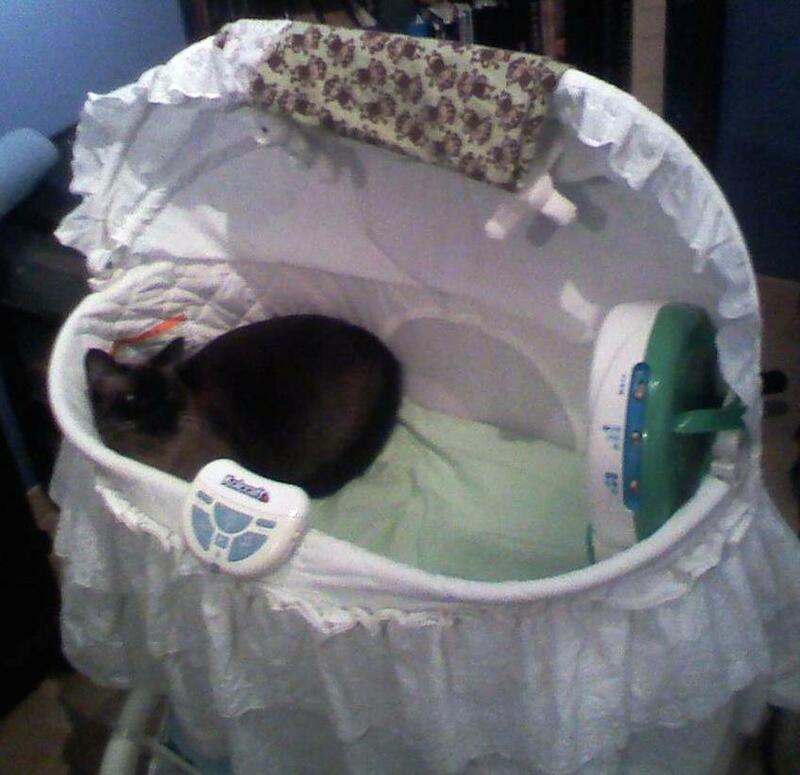 She didn’t come anywhere near us or the baby. She got off her condo to eat and use the litter box and that was it. Eventually, she started to come near us again and was very curious about the baby. She’d come up to him and sniff him and then run away. She wouldn’t come near Tim or I unless we weren’t holding the baby. Eventually, Diva became more accustomed to having “G” around. She even began sitting on our laps when we’d hold the baby. As “G” has grown, Diva has become more and more used to him and has learned to share Tim and I with him. She is a bit scared of him though. She runs by him quickly to get away from him and jumps when he reaches for her or yells. And now, I fear for her a bit. You see, while Diva just tolerates “G”, he absolutely LOVES her. It’s kind of like the Abominable snow man with Daffy Duck and Bugs Bunny. He gets so excited and screams for joy every time she walks in the room. So loudly, in fact, that he scares her and she usually ends up running back into the other room. But, on the occasion that she stays in the room, my little monkey’s eyes become glued to her and he watches her every move like a hawk. 2 Responses to "Run Diva, run!" I was waiting to hear about this day. Poor Diva, she HAD it made. But no longer. Yep. Poor Diva. I had to move her food into the living room the other day because Giovanni was in the dining room eating and screamed when he saw Diva, who was coming to eat, and she got scared and ran out of the room. Poor kitty.